This film is an intimate portrait that follows Jones as she works on her latest album, which shares the title of the film. Although she now finds herself on the invisible ‘other side of desire’ line (see Last F***able day by Amy Schumer and friends) she has lost none of the grit and the exuberance, the love of life. When Jones talks about living in LA and the loneliness there it confirms all that you might have thought about the city of celebrity; deciding she had nothing to lose she made a decision to turn her life upside down and go to New Orleans, the very heartland of music in America. Her new home inspired her to write her newest work; an album that she describes in the film as a celebration of life. We watch her try and record the new songs on the hoof in just 2 weeks. 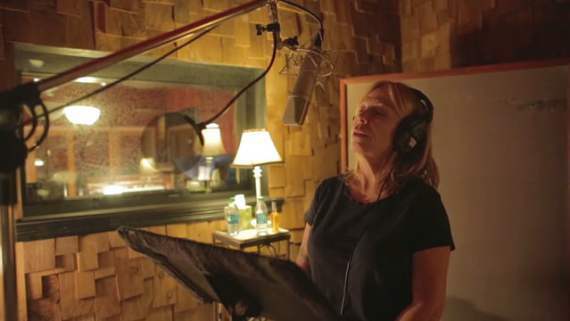 This isn’t an easy task; surrounded by men in the studio it appears hard for Jones to find a voice in there despite her speaking of finally being louder at 60 and wondering why she waited so long to be so. You feel her frustrations especially with English producer John Porter who at one point seems to admit he only took the job so he could see his old mates in New Orleans and have a holiday. It’s hard to believe that someone with Jones’s gravitas and experience has to put up with the sexist crap any other female artist would have to put up with but she does; its eye opening and saddening that women still so often don’t get respected for their talent alone. The warmth between Jones and veteran filmmaker Gail Harvey is evident – when they are alone she can vent about the process in the studio. She also reveals stories about her childhood and being a mother herself. There are some beautiful scenes of her and her grown up daughter wandering around New Orleans listening to the music, dancing and goofing around. The film reflects the closeness of subject and filmmaker with its low key presentation. What is most refreshing is to see a female musician being so open about being an older woman in the industry and showing us the workings in the studio; the unglamorous and vexatious side of being an artist. When we get to see Jones performing songs from the album she lights up the stage with a new character and vitality; she is free and fluid drawing her audience in on her journey through each song. Thoughtful and wry this is a delightful account of a much-loved performer; well worth a look.